I am going to pretend like it hasn't been a while. I am convinced that posting today will not turn out to be an isolated incident. I have decided to put memoirs together, as it were. As I get older, I find myself tending to forget a lot of things. So, for posterity's sake, I am going to start recording them here. I am curious to see if I skip the parts of my life that I wished I could forget. I guess we will find out. This isn't my house or family, but it captures the spirit. My mom and dad came from humble beginnings and both were hard workers. There wasn’t really a time when I remembered them having a loving marriage. However, back then there was a duty to kids and they had five of them. 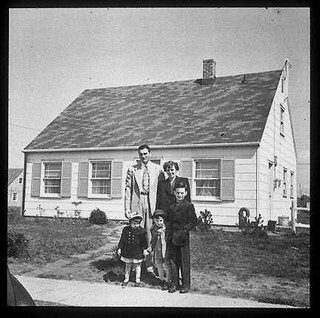 Until I was three years old, our family lived in a humble house my folks rented in a working class neighborhood. I don’t really remember too much about my life then, but the fragments I do remember include the little dog my elderly neighbor had next door. I also remember having an oak tree in the small backyard that my brother liked to climb on and get on top of the garage that was connected to the alley. He would throw acorns at me and anyone or anything else that might cause an uproar. I also remember putting pennies on the train tracks that were just across the street and gather them flattened. When I was three, we moved into a house that my folks had built in a new subdivision. Neither my father nor mother had much of an education. However, back then, you could manage to build and move into a new house if you worked hard and remained frugal. The American Dream was alive and well and my folks were full participants. Today, there is no way my parents would be able to build a house - probably not even buy one. When people talk about “the good ol’ days,” this is what they were talking about. It isn’t as much as a myth as some would have you believe. I was proud of that house. It was in a new part of town and was built in the middle of an apple orchard. There were fields and trees and woods all around. The house was also a rock’s throw from the elementary school. Happy times. There weren’t very many people in my neighborhood when we first moved in. However, across the street was a family that also had a number of kids. With those kids, we had friends that turned into adversaries and then to friends again. They lived a rural existence and I liked spending time over there mostly. Funny, my mother, now disabled and widowed, still lives in our house. The neighbors across the street are still there, too – well, the mother of that clan, also a widow, remains there. Of course her kids have mostly moved on but our lives intersect every now and then. It was these roots that should be credited or blamed for forging the core of the man I am today.